» Significance : Houses The Only Brahma Temple In India. » Best Time To Visit : Mid-October To Mid-March. In recent years, an exclusive accommodation-Tourist Village, has also been erected for foreign tourists. 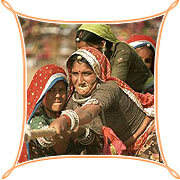 Competitions are organized for them and cultural programmes are held acquainting them with the Rajasthani way of life and culture. Pushkar has 52 bathing ghats and many temples, big and small; the most celebrated one being that of Brahma, the Creator of the Universe. Savitri Temple : A temple dedicated to the first wife of Lord Brahma the Savitri temple is located on the hill behind the Brahma Temple which can be reached by a flight of steps. The temple offers a panoramic view of the lake and the surrounding desertscape. The Brahma Temple : It is the only temple in India dedicated to Lord braham. The temple is marked by a red spire and over the entrance gateway us a beautiful statue carrier of Lord Brahma. Pushkar Fair : The Pulsating beats of vivid images of the Sacred Brahma land, Pushkar brings alive the rich tradition of Rajasthan enhancing the glory of the golden sand. Spectacular Fair Ground in the month of Kartik with bedecked Camels, decorated cattles, adventures competitions, breathtaking events, jostling rustic crowd, meditating sadhus, holy dip, vivid stalls, exotic fair, colorful desert, so typical, so obvious, It can be nothing else but Pushkar Fair. An amalgamation of a marvellous juxtaposition of commerce and devotion, Pushkar Fair, a lifetime experience in the very holy land. The fair in conjunction with having religious entity is famous for its Cattle Fair. Camels, Horses, Donkeys, Bulls, etc are bought, sold, beautified, raced and paraded on the sand. In fact, the fair is predominantly a rural gathering, where villagers from different parts of state comes with their animals and lakes are flooded with the pilgrims for the Holy Dips (SNAN). 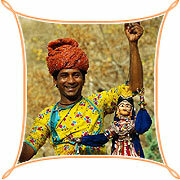 Being a major pilgrimage center Pushkar is well equipped with good accommodation options. Air : Jaipur at 146-km is the nearest airport. Rail : Ajmer at 11-km is the nearest railhead from Pushkar. Road : Pushkar is well connected by road and is 11-km from Ajmer.